Born in Austria, a French citizen, Marc Sadler has lived and worked for many years in Europe, North America and Asia. He currently lives in Milan where he is a consultant for companies... Read more in the fields of home furnishings, large and small household ap­pliances, lighting, technically advanced products and sports.In all of these areas, experimentation with plastics has often formed a key part of his activity. In the late sixties, when design was known only as aesthetic industrially, he had already shown a strong curiosity for the subject, choosing it for his thesis at ENSAD, Paris, where he graduated in 1968.His work has won many international design awards over the years: his Motorcyclist’s Back Pro­tector (designed for Dainese) is now housed in the permanent collection of design at the MOMA in New York and the lamp Mite (Foscarini) is part of the design collection of the Beaubourg in Paris. 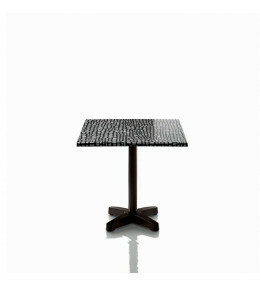 Happyhour Outdoor Tables can be used in bars, restaurants, cafes or breakout areas, either indoors or outdoors.